This photo says it all – we followed the weather, going north and west and toured some of Scotland’s remoter places. 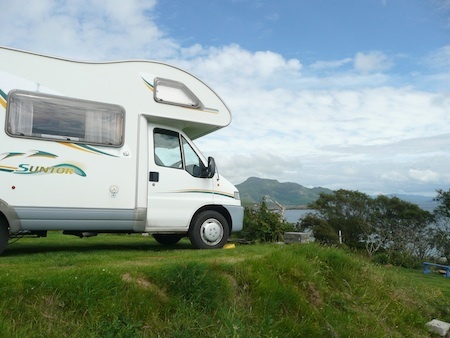 Misty was delighted with the weather, the campervan and lots of walks in beautiful places. A real way for all of us to recharge our batteries. 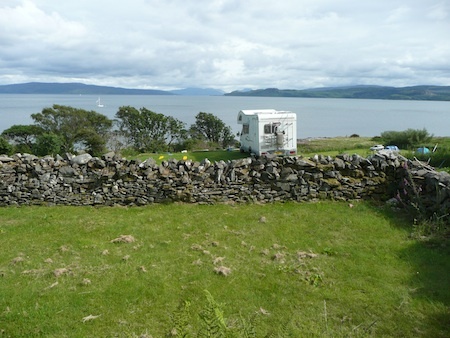 In the far west of Scotland there is always the ideal spot to be found for lunch. 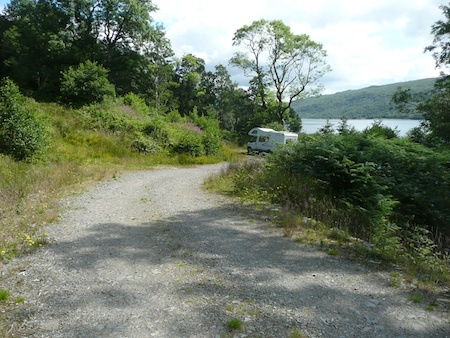 Some of the camping sites are a little challenging – not to be undertaken by the nervous driver – but well worth the effort. This one was a bit like lining up on a golf tee. As you can see, the view was magnificent. I’m not quite sure what it would be like in the pouring rain and howling wind; fortunately, Ardnamurchan has been sunny for a couple of months. Of course it will no doubt change for them as the much-talked about Jet Stream moves back into a more usual position. I am simply grateful to have been able to enjoy the area in the dry. The view last thing at night. We slept with the blinds open, grateful for every little drop of beauty that nature was willing to share with us. Now, it is back to routine chores and dealing with mail. A pile of letters and bills sits looking at me accusingly. I’m too busy looking at holiday photos and churning washing through the machine. Then there are blogs to catch up on reading. I want to see what my blogging-friends have been up to. And then there is the Dance Class tonight. Happy holidays, if you haven’t had yours yet. 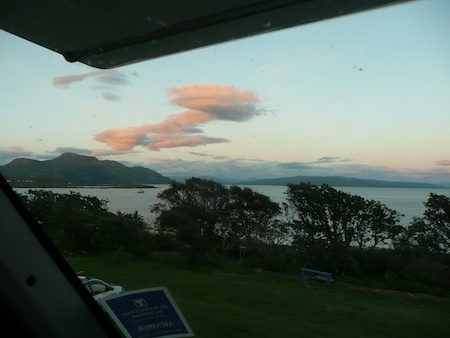 This entry was posted in Blog and tagged Ardnamurchan, campervan, holidays, Kilchoan, weather. Bookmark the permalink. Nice to see you back. This looks to have been a wonderful holiday! I am glad Scotland has seen some good weather while the rest of the country has “enjoyed” record rainfall. It is strange how, when the South is affected, you hear so much more angst about the rain/ snow etc! Glad you were able to make the most of Scotland’s unusually good weather Freda. 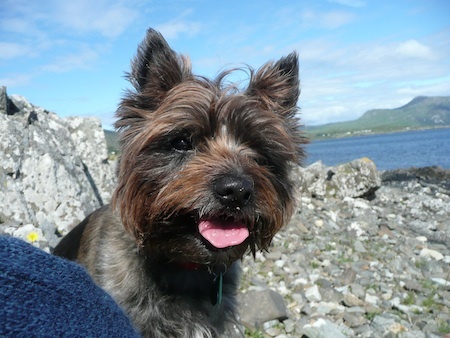 Misty looks a very happy little dog, so it’s safe to assume you’ve all benefited from your holiday. If the forecast is right (for once), it seems we are due to get some sun at last, starting this weekend. Can’t wait! It’s an awesomely beautiful world, is it not? We, too, just returned from a camping holiday. We didn’t have a cute little Misty with us, but we did have four grands and their mom and dad with us for four nights. Natural beauty really does recharge and restore. Thanks for sharing those photos. Misty is so adorable! She looks the epitome of the perfectly healthy, happy, and carefree doggie. What a gorgeous place you had to camp. Seeing your photos actually gave me pause to breathe deeply and just look at those tinted clouds you saw that night, thus feeling I had seen them in person too. Don’t go crazy trying to get everything organized at once. Let your holiday stay with you, inside you, for as long as possible. I know how beautiful your rugged nature is Freda! So glad you enjoyed it in nice weather too. We are heading off in our RV this week. More on that later. Thanks everyone, I am still being a bit lazy with posts, but it will improve soon. Dianne, my weight loss is a lot slower than yours – 7lbs – so far. I am told it is due to medication, so I am sticking to that and digging in trying to be patient.